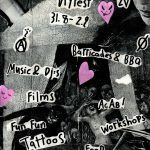 Two years ago a group of squatters decided to squat an empty house in Malminkartano, Helsinki and create a space for self-organized and free from oppression. Since then the squat has hosted numerous events; gigs, peoples kitchens, movie nights, workshops etc. What does Do-It-Yourself mean for us?